AP BC Students NTR Videshi Vidyadarana for Higher studies in Post Graduate Courses in Foreign Universities notification 2016 for BC Students of Andhra Pradesh. 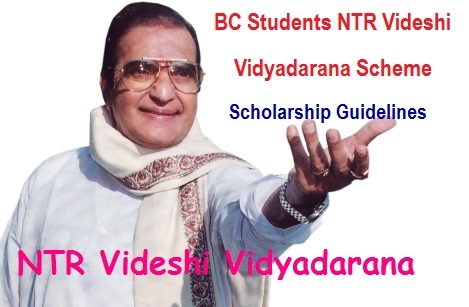 Selection Process of BC Students NTR Videshi Vidyadarana Scheme Scholarship Guidelines. AP BC Students NTR Videshi Vidyadarana Selection Process, Application Form, Scholarship Amount, How to Apply AP Foreign Education Scheme at http://apepass.cgg.gov.in/. AP NTR Videshi Vidyadarana Scheme Requirement Certificates. Financial Assistance for BC Students for Pursing Higher studies Abroad. Who are desirous of pursuing higher studies in professional courses like Medicine/Engineering/Pharmacy/ Nursing/ pure Sciences/ Humanities/Social studies, etc. in Foreign Universities. 1. From the Director (FAC) of BC Welfare, AP, Hyderabad, Lr Rc.No.2626/2015, dated: 11-08-2015. 3. From the Director of BC Welfare, AP, Hyderabad, Lr.Rc.No.B1/2626/2015, dated:21.4.2016 & 13.06.2016. 1. Government of Andhra Pradesh have made substantial investments through providing Post-Matric Scholarships to BC students on a Saturation basis. This laudable initiative over the years has encouraged a large number of BC students to complete professional Courses and other Graduate Courses. 2. The post-liberalized economy has thrown vast opportunities and challenges in India and abroad in respect of education and jobs. Students from the BC community are often handicapped because of their extreme backwardness and social stigma to access the benefit of pursuing education abroad to better their lives. 3. The proposal to introduce the “NTR Videshi Vidyadarana” was examined by Government and decided to introduce the scheme of Financial Assistance to BC students for pursing studies abroad under the Backward Classes Sub Plan 2016-17. (a) Income: BC Students whose family income is less than Rs.6.00 lakh per annum from all sources are eligible. Total income from all sources of the employed candidates or his/her parents/guardians shall not exceed Rs.6.00 lakh per annum. In all cases the income certificate must be obtained through MEE SEVA. A copy of the latest Tax Assessment as well as the latest monthly salary slip from the employer is also required to be enclosed with the application. (b) Age: The Maximum age under the scheme shall not exceed 35 years as on 1st July of the year of advertisement. (i) For Post Graduate Course: Foundation Degree in Engineering / Management / Pure Sciences /Agriculture Sciences / Medicine & Nursing /Social Sciences/ Humanities. (ii) For PhD Course: P.G course in Engineering / Management / Pure Sciences / Agriculture Sciences / Medicine / Social Sciences/ Humanities. • PG courses includes PG Diploma courses of One year, and One and Half year duration. • The scheme includes the study of CPA (Certified Public Accountant) and CPM (Certified Portfolio Manger) courses in the US, since they are equivalent to Chartered Accountancy (CA) / Cost Accounting (CA) courses in India. (d) One Child in a family one time Award: Not more than one child of the same parents / guardian’s will be eligible and to this effect a self certification will be required from the candidate. The awardee cannot be considered for the second or subsequent times as the individual can be awarded only once in a life time. (e) Countries eligible under the Scheme: USA, UK, Australia, Canada, Singapore, Germany, New Zealand, Sweden, Netherlands, France, Denmark, Russia, Philippines, Kazakhstan and China (Philippines, Kazakhstan and China only for medicine). (i) He/She should have a valid TOEFL/IELTS & GRE/GMAT. (ii) He/She should have obtained admission in an accredited Foreign University. (iv) The Candidates are required to make their own efforts in seeking admission in accredited University/Institution abroad. (v) The selected candidate has to join the concerned University within One Year of communication of selection. On expiry of this specified period of time, the award will be automatically cancelled and come to an end. No request for extension of time for availing the award is permissible under the Scheme. (vi) The candidate can change the course of study or research. Permission will be accorded on a case by case basis, subject to the approval by the State Level Selection Committee constituted under the Scheme. (vii) It will be the responsibility of the candidate to obtain the Appropriate visa or a country wherein one intends to study further under award from the Scheme and the Visa issuing authorities may kindly see that only such type of visa be issued which only permits the candidate to pursue specified course abroad and thereafter the candidate returns to India. (viii) The applications should be complete in all respects and should be accompanied by all relevant documents. The applications, incomplete in any respect, are liable to be rejected. (i) Notification shall be issued in leading dailies calling for applications and wide publicity will be given in University Campuses and in e-PASS portal in August/September and in January/February of the year (this year i.e2015-16, being the first year for implementation of the scheme, first notification shall be issued in August/September in liew of January/February). (ii) All such students desirous of applying for financial assistance for studies abroad shall apply online from 1st August to 30th September. (iii) 50% of the awards shall be earmarked for Women Candidates (if adequate number of eligible women candidates are not available then Male candidates may be selected against this 33%). Bifurcation of BC quota as 7 : 10 : 7 will be done between BC-A,B, D groups. The awards shall be proportionately allocated to the 13 districts based on number of eligible applications from each district. • Caste Certificate from Mee Seva. • Income Certificate from Mee Seva. • Date of Birth certificate. • Mark sheet from SSC/Inter/Graduate/PG level. • GRE /GMAT or equivalent qualifying exam/test score card. • TOFEL / IELTS score card. • Admission offer letter from Foreign University (I-20, letter of Admission or equivalent). • Copy of the latest Tax assessment is to be enclosed. • Copy of Bank Pass Book of Nationalized Bank. • Photo to be scanned and uploaded. The Selection shall be conducted by a State Level Screening Committee constituted by Government with the following members. The Bio-data of the candidates who applied online shall be made available to the Committee. In case of more number of applications, the committee shall evolve appropriate guidelines for selection giving prior notice. Instalment-II: An amount of Rs.5.00 lakhs shall be payable to the students upon production of the 1st Semester results. (ii) Sanction proceedings mentioning that Rs.10.00 lakhs is sanctioned to the individual towards fees and living expenses by way of a grant subject to his/her joining the Course, shall be issued to the Candidates selected by the Selection Committee. The sanction proceedings can be made use of by the Candidates for obtaining a Visa from the respective Embassy. (iii) Earnings from Research/Teaching Assistance-ship: The awardees are permitted to supplement their prescribed allowances by undertaking Research/Teaching Assistantship. 5. Utilization Certificate: Utilization Certificates shall be obtained from the student with due endorsement of concerned University Authorities for record purpose under the scheme. 7. The Director, BC Welfare, AP, Hyderabad is shall take further necessary action accordingly. what is pending at s.l.c? what does it means?